KoopaTV: Kirby Star Allies: Dream Friends Wave 2 Update Released! Kirby Star Allies: Dream Friends Wave 2 Update Released! By LUDWIG VON KOOPA - Kirby Star Allies version 3.0. Get the update. Has slightly more than just Dream Friends in it. 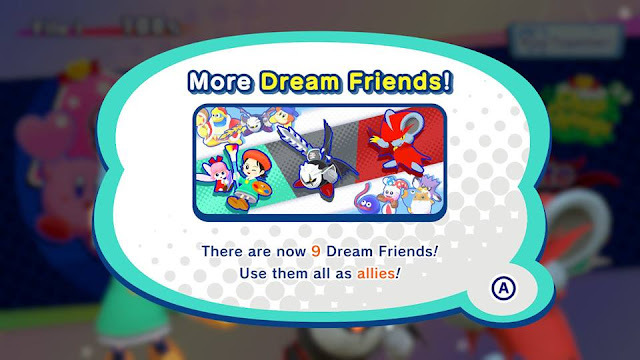 As was the case for Wave 1, the developers actually put effort into fully integrating the new Dream Friends. They show up in all-friend cutscenes like every other friend, and other end-game and post-game story mode content that is spoiler-y to share but great to experience. The Dream Friends themselves are incredibly potent. Here's one of the in-game notifications you get after installing the update. The big thing that Nintendo is promoting are the availability of these Dream Friends and their custom Guest Star ???? Star Allies Go! levels. Secondarily, there are three new celebration pictures that each require eighty blue puzzle pieces. As of writing I've just started. Lastly, the game has some updates to Guest Star ???? Star Allies Go! for the non-Dreamers. You can play through multiple helpers’ quests without finishing them. Previously, you had to finish an entire character's set of levels (each take about 80 minutes) before being able to play another character. I'm not sure why you wouldn't want to do that (you'll be the most effective while absorbed in a given character's moveset instead of going through all sorts of different files). Another update to Guest Star is that they shortened Level 5 by removing the introduction to the story mode post-story stage, Extra Planet δ. (In story mode, this is also the stage they updated.) This takes two and a half minutes off the time. It doesn't look like they've added or removed anything else, based on my post-update playthrough with NESP. There's a number of segments that I would've liked for them to also remove (such as certain underwater segments, cannon segments, and segments where you just sit around and avoid getting crushed by moving blocks or the floor/ceiling), but I'll save that for my still-to-come review of Kirby Star Allies. If you've already completed Guest Star ???? Star Allies Go! with a given character, you can now go back and replay Level 5 with anyone you've completed it with to try to get a more efficient time. You can't go back and replay the earlier levels — like Level 4, unless you make a New Game with that helper and start from the beginning. There will be a Wave 3 to come for this game. Ludwig won't write the Kirby Star Allies review until after Wave 3's release. He also wants to complete Guest Star ???? Star Allies Go! with every character, and he is saving the nine Dream Friends for last because he's patient enough to save the best for last. He's actually almost done with everyone else's. Here is the release of Wave 3! Ludwig finished everything in the game, and wrote a review of it. It sounds like a grind to complete each level with every character. I imagine it is similar to clearing each stage with every weapon in Splatoon 2's campaign mode. I reached the second area before I stopped because it was just too repetitive and did not seem worth the time. They are quite similar, but Kirby Star Allies's Guest Star mode works a little differently. For Splatoon 2 it is the same level for every weapon (with minor quality of life changes for weapons with crappy range that make it possible), but in Kirby Star Allies, there is a base set of story mode locations that every Helper goes through, and then added on top of that are locations selected by the attributes of the partner. That means Birdon gets all of the Bluster-based puzzles, while Vividria gets anything with the Artist canvas. And... Chef Kawasaki gets only the bare minimum because there aren't any Cook puzzles.